Southern Oregon is a unique and historically important region for many reasons. Human activity in southern Oregon was conditioned over centuries by geology, climatic zones, topography, natural resources, and, since the 1800s, remoteness from the urban centers of commerce and government of the Willamette Valley. Geographically speaking, the region is the northern part of the bioregion made up of the Klamath, Siskiyou, and Southern Cascades mountains, or most of the northern half of the apocryphal “State of Jefferson.” Having steep, heavily forested mountains and lacking navigable waterways, this region remained isolated until well into the 20th Century. Its distinct natural resource base was exploited through mining, logging, and irrigation agriculture, especially for fruit culture. The regional economy depended on transportation systems to get the products of forestry, mining, agriculture, and other industries to markets in and beyond the region. There has been incremental growth in tourism and outdoor recreation over the last century, with later transportation networks bringing in many visitors. The region’s interest groups had distinct and often conflicting concerns when dealing with local, county, state and national governments. The Southern Oregon History Collection brings together books, maps, government documents, oral histories, correspondence and miscellaneous materials that document the unique historical experience of Southern Oregon. Most materials focus on historic era settlement or economic development in Coos, Curry, Douglas, Jackson, and Josephine Counties. Agriculture, mining, forestry, commerce, education, government, and politics, religious organizations, and social life of the region are among the aspects represented. Local booster organizations published colorful promotional booklets that encouraged settlement from the 1890’s to around 1915, several of which are included. Complete early histories of Oregon have been digitized and added to show the place of Southern Oregon in he broader context at the time these works were written. Several early biographical reference works for the region are included. While the collection is not primarily genealogical, family name searches may find biographical accounts or mentions in books or oral histories of people who lived in Southern Oregon from the1840’s to the mid-1900’s. Most materials digitized for this online collection are in the public domain, although copyright permissions have been obtained for any copyrighted materials included. The Southern Oregon History Collection project is supported by the Institute of Museum and Library Services through the Library Services and Technology Act (LSTA), administered by the Oregon State Library. The project began February 1, 2006, with the goal of digitizing at least 250 items representing regional history within one year. Partner organizations for the first year of this project are: Southern Oregon Historical Society, Jackson County Library Services, Josephine County Library Services, and Southern Oregon University Hannon Library. Historical materials held by SOU Hannon Library, the Southern Oregon Historical Society (SOHS) and public libraries of Jackson (JCLS) and Josephine counties are focused on the Rogue, Applegate, and Illinois River valleys, population centers (Medford, Jacksonville, Ashland, Grants Pass) and more remote natural resource areas and communities of Jackson, Josephine and adjacent counties. Also included are materials about coastal areas, area national parks and monuments. Collection strengths and holdings vary; SOU is strong in published histories, historical maps, and government documents; JCLS has unique copies of early maps and commercial documents for Ashland and Medford, and the Josephine County Library System has early Grants Pass city ordinances. The region’s richest repository of primary source materials, including transcribed oral histories and other unpublished works, is at SOHS. SOU Hannon Library is seeking grant funding to continue the Southern Oregon History Collection project an additional year in order to digitize and add materials held by new partner organizations in Coos, Curry and Douglas Counties. The extension would also enable digitizing and adding selections from the Rogue River National Forest Historical Records Collection through a special arrangement with the Rogue River Siskiyou National Forest. 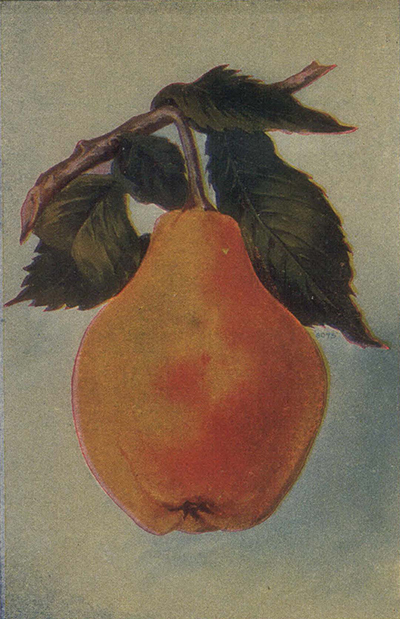 Pear, from Rogue River Valley Realty Edition, [Saturday Review (Medford, Or. )], April 30, 1918, p. 1.